Music Rack by Wendell Castle. Purchased by the American Craft Council, 1964. “Crafting Modernism: Midcentury American Art and Design” assembles the work of some 160 artists and designers — Alexander Calder, Isamu Noguchi, Wendell Castle, Jack Lenor Larson among others at the Museum of Arts and Design in New York. This comprehensive show covers the period from 1945 to 1969, slightly more than two decades when seismic social and cultural changes took place in the postwar world. Think Eisenhower and Nixon, Korea and Vietnam, Buddy Holly and Elvis. “Crafting Modernism” begins with pioneering craftspeople and designers of the late 1940s and 1950s and ends with the counter-culture movements of the sixties when craft began to enter the realm of fine art. At the end of World War II, returning soldiers and young optimistic couples in postwar America were looking for something new. No more chintz and Chippendale for them. They did not want to live in overstuffed and overdone rooms with conflicting patterns and colors. Many of these baby boomers embraced a modernist sensibility, rebelling against conformity and tradition. They preferred the handmade to the manufactured, soft lines to the hard edged for their new suburban, ranch-style tract houses. For them, the handmade had greater value and meaning than anything factory made. On the other hand, as MAD curator Jeannine Falino writes in the show’s catalog, artists were also choosing a different way of life “… the choice of a crafts lifestyle was attractive to many who were concerned with societal issues.” Supported by the GI Bill and the emergence of various schools and universities teaching contemporary crafts, independently minded artists could set up their own studios, teach, or making a living in whatever craft media they chose. This new generation of craftspeople and designers, well represented in this show, were experimenting with curvilinear forms, less ornamentation, and above all natural materials. This new direction in craft (clay, fiber, wood, metal, and glass among other materials), art, and design explains — in part — how we have arrived at where we are in the world of design — and what could come next. The mid-century stuff in this show looks great. Sam Maloof’s 1957 Rocking Chair is still impeccable— a perfect example of the “truth-to-material” aesthetics of the period: no unnecessary ornamentation, anti-historical, no nails (just wooden joinery). Whether Glidden Pottery or Eero Saarinen’s laminated birth Grasshopper chair, the emphasis is on simple, elegant, and practical pieces which continue to dominate today’s shelter magazines . A major characteristic of this mid-century era is the exchange of ideas among the artists in the craft, art, and design worlds. 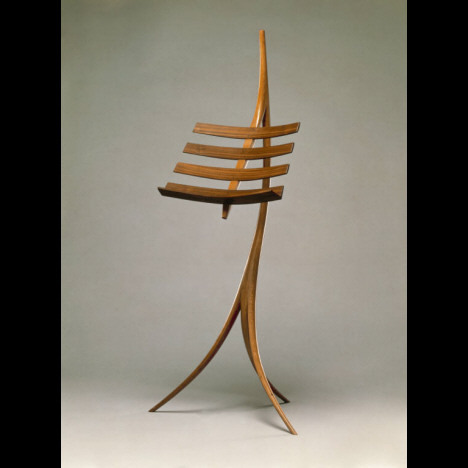 Textile designer Dorothy Liebes, furniture maker George Nakashima, and Isamu Noguchi moved fluidly from one art form to another. 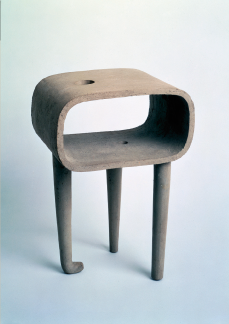 Noguchi, in particular, had an extraordinary run as a sculptor, designer, ceramist, and woodworker. He produced an amazing range of work, from stage sets for Martha Graham to sculpture installations. His handmade paper Akari lamp, ceramic forms, and iron “Calligraphics” sculpture are emblematic of the influential objects on exhibit. In the mid-century era, they demonstrated the intersection of art and design. The show makes a much sharper, edgier turn with the work of artists in the sixties. Form and function have been replaced by art for arts sake. JFK in his inaugural address in 1961 said that “a torch has been passed to a new generation.” This was the Woodstock generation that broke free of rigid cultural constraints. Deviation from the norm engendered enormous social, sexual, and political turmoil. 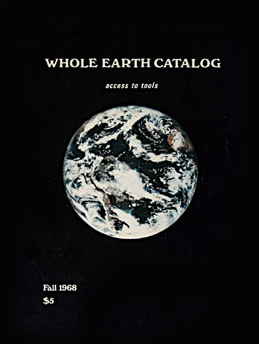 Stuart Brand’s Whole Earth Catalog, Fall 1968 became the bible of the communes. It’s on exhibit, along with other iconic sixties objects such as psychedelic posters, a handbag made for Janis Joplin, and the playful, witty, revolutionary Claes Oldenburg 1963 Bacon, Lettuce, and Tomato Sandwich , made of vinyl, kapok, fibers, wood, and acrylic paint. “Crafting Modernism” captures the spirit of mid-century America with sculpture, jewelry, glass, furniture, textiles, posters and paintings by such artists as Alexander Calder, Wayne Thiebaud, and Dale Chihuly and their peers whose work continues to influence a new generation. In their youth, their work was over-the-top daring and untraditional. Today, many are iconic symbols of their time. While the goal of the exhibition is to convey a sense of history in the art, craft, and design worlds, it also demonstrates how much that was produced and created postwar is still relevant, coveted by collectors, and very much part of the world we live in.